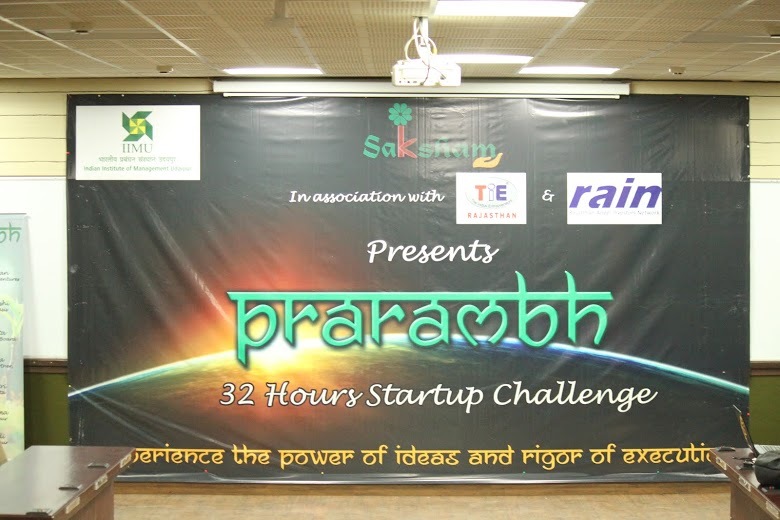 Prarambh – The 32 hour Start-Up Challenge concludes on a highly successful note at IIM Udaipur! Entrepreneurship is one of the key pillars of IIM Udaipur’s foundation. And fostering its spirit within the student community and the society at large has been a prime endeavour of Prof. Janat Shah, Director – IIM Udaipur. 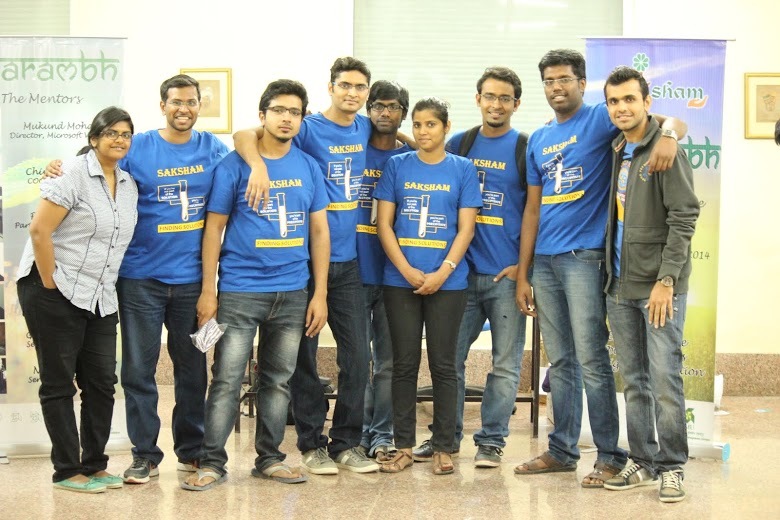 Taking the baton of the league forward, Saksham – The Entrepreneurship Club of IIM Udaipur, presented the first edition of Prarambh – The 32 hour Start-Up Challenge from 7th – 9th March, 2014 at IIMU. 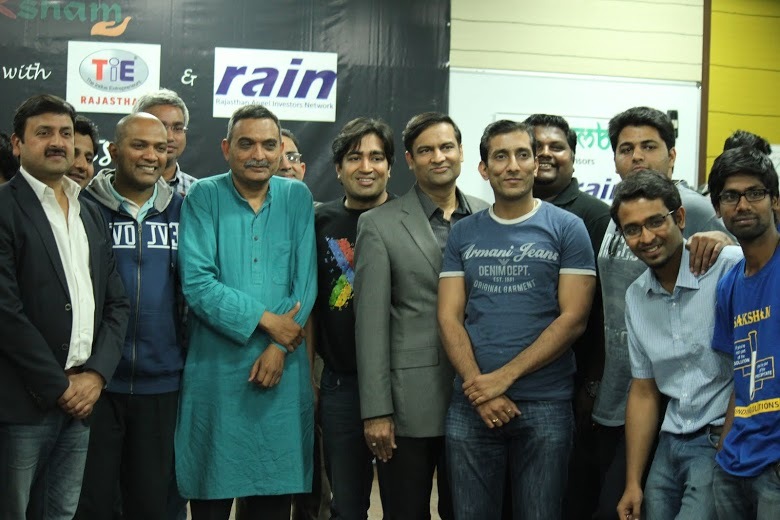 Prarambh, co-sponsored by Rajasthan Angel Investors Network (RAIN) and The Indus Entrepreneurs (TiE) was organized with a vision to provide a launch to prospective entrepreneurs to build on their ideas. The idea of the start-up platform is to bring together budding entrepreneurs from different backgrounds including software developers, MBA students, marketers, designers and enthusiasts under one roof to develop synergies and facilitate the translation of ideas to reality. The exhilaration of pitching their idea as well as the thrill of working in diverse teams and being mentored by distinguished entrepreneurs was what led the participants to the doors of IIM Udaipur. 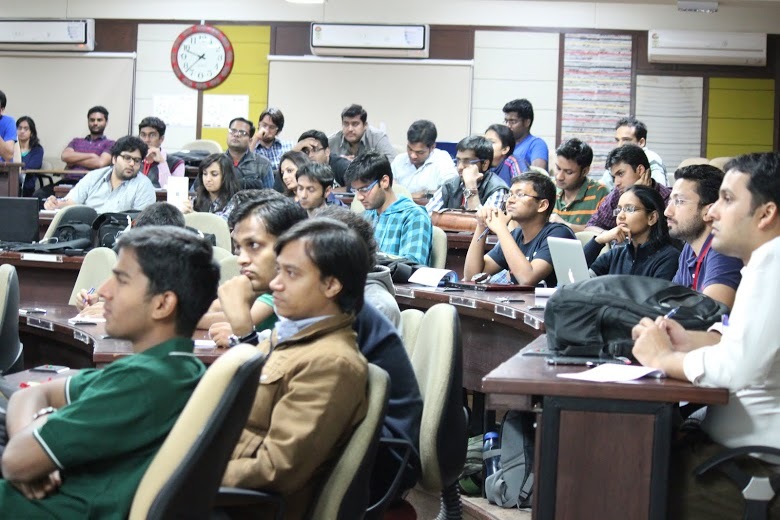 The event received an overwhelming number of 160 registrations from individuals coming from 18 cities across India, 15 companies and 40 colleges including reputed institutes like Boston University USA, IIMs, XLRI, SP JAIN, NITIE, JBIMS, IITs, BITS and NITs. Out of these entries, 45 enthusiasts were chosen to participate in the ultimate challenge round. The event kicked-off on 7th March, Friday with an idea pitching session where all the participants gave a lightning pitch of 1.5 minutes to express their innovative business ideas. This round was followed by a selection of top 6 ideas through a collective voting process. All the participants were absorbed in the 6 teams formed around the most popular ideas. The event witnessed some amazing creativity and enthusiasm shown by the participants. The next day began early with the participants gathering all charged up to showcase their talents. This round was the real executional challenge of the competition. 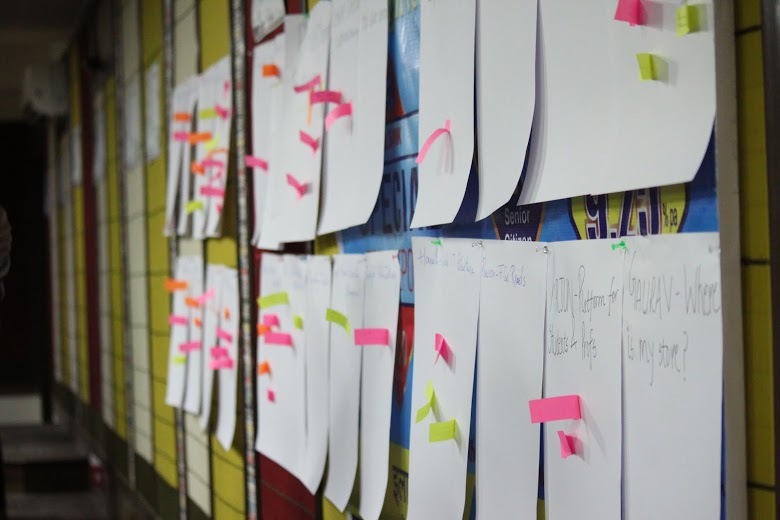 In 32 hours, the teams had to develop a minimum viable product i.e. a working model of their ideas along with a customer value proposition, marketing strategy and a future road-map. The difficult part of this was building a product from scratch under severe time-pressure with a new team and thus testing optimal resource utilization, team working capabilities and managerial skills and decision making in a competitive environment under constraints. The teams got 7 mentors each a successful serial entrepreneur, to guide them during the journey of this competition. Mr. Mukund Mohan, Director – Microsoft Ventures, Mr. Pranay Gupta, Partner – 91 Spring Board, Mr. Anuj Pulstya – Angel Investor, Mr. Gaurav Mantri, Founder – Cynapta, Mr. Gaurav Sharma – Serial Entrepreneur, Mr. Nilesh Trivedi – Serial Entrepreneur and Mr. Chintan, Founder – Start-Up Oasis graced the event to mentor the 6 teams. 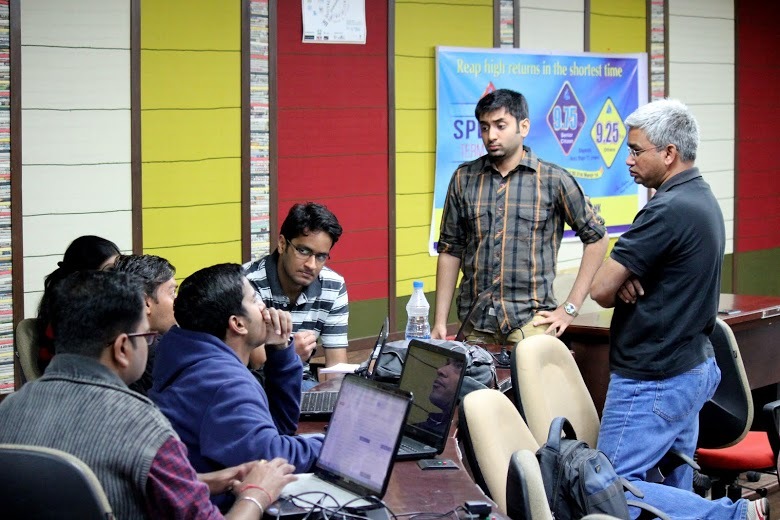 This day had the teams brainstorming the idea scope and experiencing the rigour of execution. The teams had to re-work on their business models multiple times in order to come up with a winning product. The teams had to conclude their final work on 9th March, Sunday. The grit demonstrated by the teams to complete their product development and presentations in time was spectacular. Eminent personalities from the world of entrepreneurship were present to judge the work of the 6 teams. Mr. Rajneesh Bhandari – TiE and Mr. Shailesh Vikram Singh – Executive Director, Seedfund Advisors were part of the panel of judges. All the teams gave captivating presentations and received massive applause from the crowd. The final teams which were adjourned winners were Wedway and Buzzcaptor. The closing ceremony witnessed some amazing surprises. Mr. Mukund Mohan encouraged the teams to carry forward the work in their collaboration and invited them to join the Microsoft Accelerator Program. 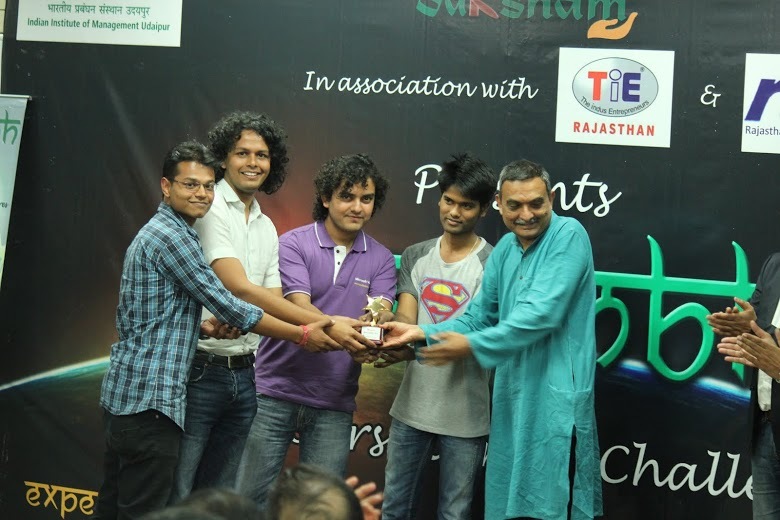 Mr. Pranay Gupta of 91 Spring Board also offered free hosting on their platforms of the projects by the winning teams. The closure of the event ceremony and the spirit of the organizing team were exuberated when it was announced that Saksham has been awarded the Best Debutant Entrepreneurship – Cell in the North Zone by National Entrepreneurship Network (NEN). The success of the event also saw an acknowledgement from the corporate participants when Mr. Rajneesh Bhandari announced that TiE would partner with Saksham for its events lined in the future. The event culminated with a dinner and a fun-filled evening to celebrate the tireless efforts of the teams. The mentors and the judges shared their experiences of being entrepreneurs and gave inspirational wisdom to the students to pursue their passion. The participating teams bid farewell testifying that the electrifying weekend of Prarambh at IIM Udaipur proved to be a memorable experience. Prarambh’s success marked a new beginning for IIM Udaipur which is set on a unique path of building a different academic and corporate culture promoting entrepreneurship.